Stickie notes covering desks and an abundance of unorganized spreadsheets are an outdated system of management for a multi-billion dollar industry. The question is, how exactly can you track early stage companies and build the relationship necessary to maintain potential business? “A recent Gartner Inc. research study showed that 75% of managers planned to make further investments in CRM in the coming year.” In doing this software implementation, it is important to truly understand how to use successful Private Equity CRM and Venture Capital CRM. According to an in depth study done by Navon partners, How Venture Capitalists Source Great Start-up Investments, closing one deal often requires sourcing 80-100 deals. This requires a streamlined sense of management and contact, ensuring your firm has the most appealing option. Although excellent communication skills are most definitely listed in the job description, over 100 journalists were surveyed and zero listed private equity firms as excellent communicators (Navon). This is a huge problem in an industry that needs constant attention to detail and contact. In order to address this area of concern, a profile needs to be developed for the targets that you consider relevant to your companies interests. Then use social media and web scraping to build a list. Track every touch relevant to the client no matter what company it may be with. This is where the integration of successful management and CRM are key. It is important to recognize that behind early stage startup companies, there are people, not just customers. Building a relationship beyond what they as clients could do for your company is essential. Depending on what area the early stage company is in, you are able to add information about what exactly the company is doing. You can access this information while on the phone with them, ensuring you are prepared to relate in more ways than just business. 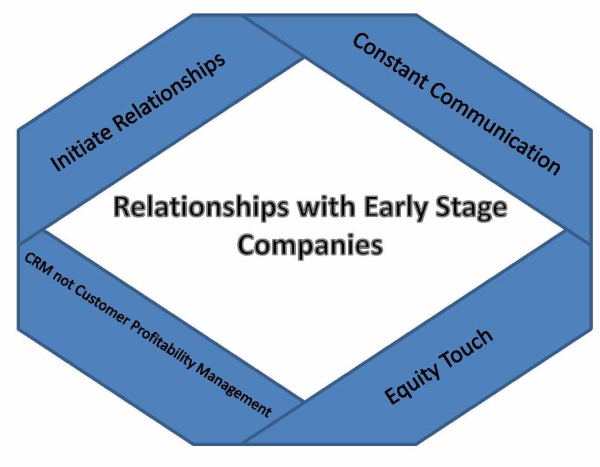 Relationships are all very different and it is important to realize that every early stage company does not have the same needs. Relationships will evolve with each interaction so it is important to track the touches and be aware of the progress you may or may not be making. Overall it is important to realize that switching to a CRM is not a quick fix to solving all management issues and client clutter. It is a tool that if used with proper management and attention can bring your firm to a level of excellence in customer relationship management. 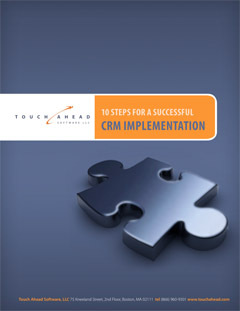 This entry was posted in Blog, News and tagged CRM Solutions, Successful CRM. Bookmark the permalink.